I have a confession to make. I dislike water. It’s just not good. I don’t understand what all the hubbub is about. Sure your body may be 70% ish water and it may be vital to survival but does it have to taste so sucky? As far as I’m concerned those people who demand they like water are just showing off and shouldn’t be trusted. Alright fine, I’ll gulp back an entire large SIGG water bottle during and after Bar Method. Yesterday I couldn’t get to class so instead went for a run before heading off to meet up for a friend’s birthday dinner, and upon sitting down gulped back three entire glasses of ice-cold H2O. I didn’t do this because I like the clear liquid I did it because I’m in a constant state of dehydration and without drinking post exercise (and post super Wendy sweating) I know a headache as big as the grand canyon is going to smack me right in the head. I always drank a TON of water while I was attending sales conferences but this was more to fight boredom and have an excuse to leave the room a dozen or so times to use the bathroom. That’s another downfall of water. I already have to pee more than the normal person. Add water and I might as well just move into the bathroom. Still, I know it is important and I should be drinking more. I do like sparkling water, I realize that makes no sense, but that stuff is pricey and I’m just not in a financial position to shower myself in such frivolous niceties right now. What to do? One day, as I strolled down the grocery aisle, I saw the Crystal Light water flavoring bottle things. This seems to be quite the craze right now as all the “water” and “sports drink” folks seem to have a horse in the “liquid water flavor” race. 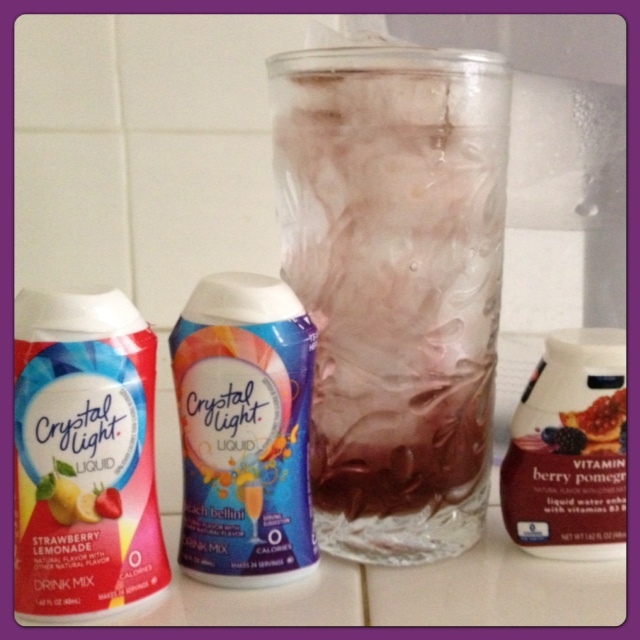 I choose Crystal Light. It’s 0 calories and was probably on sale at the time. After trying it out I returned later and purchased a couple more flavors. One day I saw that the generic Ralph version was on “close out” so I bought a couple of those to have too. I love them. They make water so much tastier. I actually don’t use a lot of the flavoring and will often put a squirt in then keep adding water to the glass as I drink (this is just tap water …. I use a Brita filter but lets face it I change that filter only once in a blue moon so I’m probably consuming at least 99.99% straight tap water). The purple-ish Crystal Light colored one is my favorite. That’s why you don’t see it in the picture because it is all gone! Yuummm yummm. Admittedly it may all be in my head but who cares? I can now stomach drinking glasses of water during the day. I don’t feel any better or any different but doctors and estheticians everywhere say I should so I’ll keep it going for a while. As it’s getting hotter the dogs need more water too. Riggins is an odd duck and will only consume water if I’m with him. I think it is his way of not drinking water while I’m gone so h e doesn’t have to pee but he doesn’t seem to drink water when he is outside alone either. Scares me … silly pup. ALL the dogs will gobble up the water like it is … well … water, each time they come through the door. Today at the dog park Asscher (my daycare doggie) refused to drink anything but when we came home she drowned herself in the big bowl. I’ve had to up the ante on the water bowls I use and now have the “big one” out for all to enjoy (I sit them by the kitchen sink so that they are easy to access for the dogs and all humans are bound to trip over them). 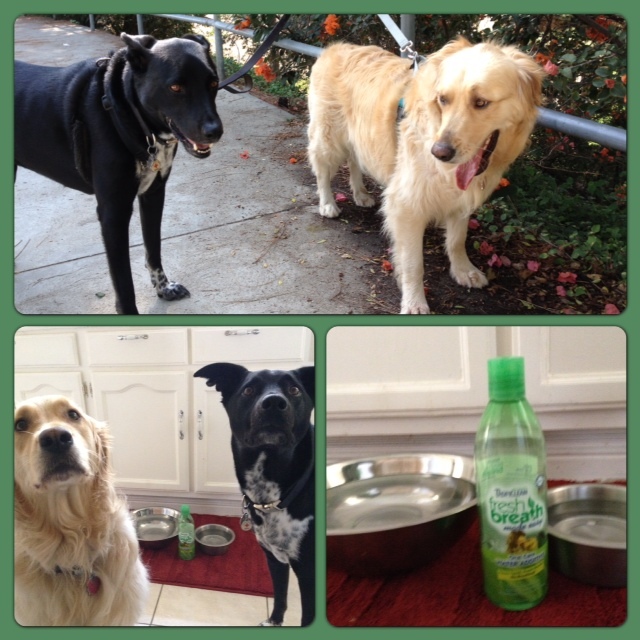 The dogs get an additive in their water too. It’s to help keep their teeth clean and breath smelling nice(er). There are a number of different versions of this product. Riggins and I like the one available from SitStay.com the best but the one we have now is from one of the big pet supply chains. Of course once outside both Asscher and Riggins use the wading pool as a giant dog bowl. That works too! Chas is in love with Mio. We just bought three generic ones at Walmart. Great price! Plus now he will drink flavored water instead of soda. I like water… But it is sooooo much better with a little flavor. I hate water and am constantly dehydrating myself as well. I’m sure this contributes to our constant need to pee 🙂 I’ve taken up Mio and crystal light lately, as well sparkling, with my soda stream. Seltzer with a touch of cranberry juice is really great. brings out the sweetness in the cranberry.